The Finnish proposal offers a basic income of around $850 to $900 per month, roughly $10,000 per year. Proponents of Universal Basic Income (UBI) see it as the only solution to automation's replacement of human labor, a topic I discuss in depth in my new book A Radically Beneficial World: Automation, Technology and Creating Jobs for All. Advocates of guaranteed income for all claim the program can be paid for by two mechanisms: taxing the owners of robots and software who are presumed to be banking enormous profits off automation and by cutting existing social welfare programs that Universal Basic Income replaces. 1. Profits and payrolls both fall as automation replaces human labor. It's easy to understand why if we consider what happens to Company A's profits and payrolls when it replaces huge swaths of its labor force with robotics and software/AI. Its head-count and payroll expenses immediately decline, of course, but so do its profits: as robots and software become cheaper, what's to stop Company A's global competitors from buying the same robots and software? The reality is the tools of automation are commodities, rapidly falling in cost and available everywhere. The scarcity value of these tools is effectively near-zero, and as economist Michael Spence pointed out, profits and value only flow to what's scarce. As Erik Brynjolfsson, Andrew McAfee, and Michael Spence explain in their 2014 article New World Order: Labor, Capital, and Ideas in the Power Law Economy, capital and labor have very little scarcity value: both are in over-supply. This is why capital earns effectively near-zero return, and why the value of conventional labor is declining. Automation, capital, labor and everything that can be commoditized globally has near-zero scarcity value, and hence near-zero profitability. As automation eliminates jobs, it also slashes profits. rather than boost profits as Basic Income proponents anticipate, automation reduces profits along with payrolls. 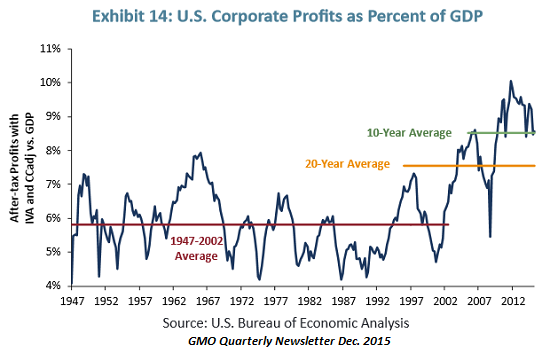 Thus the more realistic projection is for record corporate profits to return to their historical average of around 5%-6% of GDP, which would mean profits falling from $1.9 trillion to $1 trillion. So let's run some numbers. The federal government currently spends about $3.8 trillion and collects about $3.3 trillion in tax revenues; it borrows the difference ($500 billion) by selling Treasury bonds--in effect, borrowing from our grandchildren to fund our benefits today. This is politically expedient, but morally and fiscally bankrupt. State and local governments spend another $3.2 trillion source: U.S. Census Bureau. State and local governments collect tax revenues of $3 trillion and borrow the balance. Paying all 322 million Americans $10,000 a year would cost $3.22 trillion.Proponents claim this can be paid by redirecting existing welfare programs, but a quick review reveals this as nonsense. All state and local government social welfare programs are around $500 billion, and programs such as food stamps (SNAP) that would presumably be replaced with Basic Income are relatively small budget items: SNAP is around $75 billion. As for Social Security: those receiving around $850 per month in Social Security benefits won't mind their SSA benefit being replaced by Basic Income--they will receive the same amount. But those earning $1,500 in Social Security benefits will expect to receive $1,500, not $850. The net result is the savings from swapping Social Security payments for Basic Income are also modest. The SSA distributes around $950 billion annually to about 69 million recipients. As a rough estimate, perhaps $500 billion could be swapped from SSA to Basic Income. As for Medicaid and and Medicare, Basic Income does not include medical care.These programs will be untouched by Basic Income. Bottom line, Universal Basic Income will add roughly $2.2 trillion to government spending, while profits and payrolls--the sources of tax revenues--will both decline. The only way to pay for another $2+ trillion in spending is to raise taxes or borrow it from our grandchildren--a proposal that is morally and fiscally bankrupt. Raising $2 trillion more in addition to the current federal tax revenues of $3.3 trillion and state/local taxes of $3+ trillion is a tall order. If the economy enters a profit and payroll recession (from any of several potential causes, including automation, rampant financialization, global recession, financial crisis, etc. ), tax revenues will crater. Who will pay all this additional tax? Yes, those earning $150,000 or more will end up paying their Basic Income payment as additional taxes, but the number of high-earners (who already pay roughly 85% of all federal taxes) simply isn't large enough to skim another $2 trillion. Even if every dollar of corporate profit was taken (not likely, given the lobbying power of corporations), that would still leave the Basic Income program $1 trillion short. Who will pay all this additional tax? If we say the remaining employed, that leads to this question: if much of your wage is being levied to support people who don't work, what's the motivation for working at all? Why not join the work-free crowd? And what happens when the most productive members of the workforce quit or decline to be productive? Robots can't do everything, despite lavish techno-claims to the contrary. In sum, the psychology of punishing the productive and rewarding non-contributors is destructive to everyone. Have proponents forgotten that humans are prone to emotions such as resentment? Resentment goes both ways; the recipients of Basic Income will be getting by, but they won't be able to build capital or better their financial stake. They are in effect Basic Income Serfs. Proponents also believe that the loss of work will free everyone getting a basic income to become an artist, composer, musician, etc. As I noted in "Super-Welfare" Guaranteed Income For All Isn't a Solution--It's Just the New Serfdom, Since meaningful work is the source of positive social roles, Hell is a lack of meaningful work. In the myopic view of the Basic Income proponents, humans are nothing but consumer-bots who chew through the Earth's resources in their limitless quest for more of everything-- what the Keynesian Cargo Cult worships as "demand." Tragically, this blindness to humanity's need for meaning and the elevation of spiritually empty consumerism to a Secular Religion leaves the basic Income crowd incapable of understanding this timeless truth: the only possible result of robbing people of their livelihood is despair. Once meaningful work vanishes, so do positive social roles. This is why guaranteed income for all is just a new version of Socioeconomic Hell. Being paid to do nothing does not provide meaningful work or positive social roles, which are the sources of positive identity, pride, purpose, community and meaning. These are precisely what basic income for all doesn't provide. To the degree that serfdom is political powerlessness and near-zero access to the processes of accumulating productive capital, guaranteed income for all is simply serfdom institutionalized into a Hell devoid of purpose, pride, meaning, community and positive social roles. This is why I say The Future Belongs to Work That Is Meaningful. KMO and I discuss these topics and more in The Search for Scarcity. Come on, people--we can do better than the bankrupt serfdom of Basic Income. Thank you, Iris R. ($30), for your splendidly generous contribution to this site -- I am greatly honored by your support and readership. Thank you, Tina C. ($25), for your fantastically generous contribution to this site -- I am greatly honored by your support and readership.